As August begins to fade, September of course ushers in a fresh fashion palette for us all. One of the prime times to have fun being a girl. 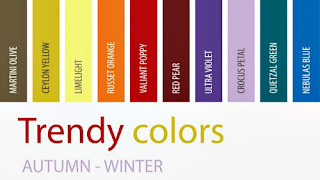 To help, I have added a "Trendy colors" chart from Deborah Boland and the "Fabulous After 40" fashion blog. Warm undertones range from peach to yellow and golden. Some people with warm undertones also have sallow skin. Cool undertones include pink and bluish hues. If you have a neutral undertone, this means that your undertones are roughly the same color as your actual skin tone. How do you determine which undertones you have? Look on the inside of your wrists for a vein or two. If they look blue or purple, it means you have cool toned skin. If green you are warm toned. If you have a hard time telling, you are a nuetral skinned person. 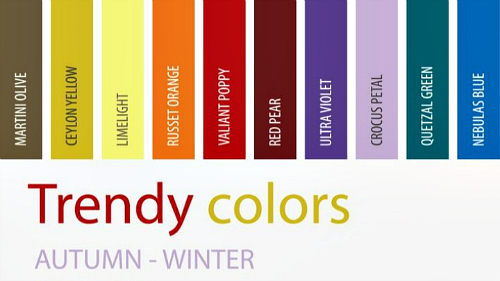 All of which leads us back to the chart above and the colors you will look best in. For example, I am a warm skinned person, so I lean towards the reds, yellows , oranges and olive greens. If you are a cool toned person , you look best in the blues, purples and emerald greens. Finally, neutral toned transgender girls can rock all the colors. You see, when you break down all the different standards cis women go through to look effortlessly good, it's not that difficult. Being transgender though, means we have to do it better. I have been green around the gills once or twice, but that's a horse of a different color.